CARAWAY, Thaddeus Horatius, (husband of Hattie Wyatt Caraway), a Representative and a Senator from Arkansas; born on a farm near Springhill, Stoddard County, Mo., October 17, 1871; attended the common schools; moved to Arkansas in 1883 with his parents, who settled in Clay County; graduated from Dickson (Tenn.) College in 1896; taught in country schools 1896-1899; studied law; admitted to the bar in 1900 and commenced practice in Osceola, Ark. 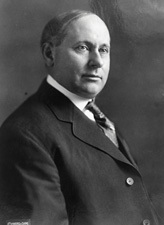 ; moved to Lake City, Craighead County, Ark., in 1900 and to Jonesboro, Ark., in 1901, and continued the practice of law; prosecuting attorney for the second judicial circuit of Arkansas 1908-1912; elected as a Democrat to the Sixty-third and to the three succeeding Congresses (March 4, 1913-March 3, 1921); did not seek renomination, having become a candidate for Senator; elected as a Democrat to the United States Senate in 1920; reelected in 1926 and served from March 4, 1921, until his death, due to a blood clot in the coronary artery, in Little Rock, Ark., November 6, 1931; lay in state in Arkansas state capital in Little Rock, November 8, 1931; interment in Woodlawn (formerly West Lawn) Cemetery, Jonesboro, Ark. Dictionary of American Biography; Ledbetter, Calvin R., Jr. The Other Caraway: Senator Thaddeus H. Caraway. Arkansas Historical Quarterly 64 (Summer 2005): 123-146; U.S. Congress. Memorial Services. 72nd Cong., 1st sess., 1931-1932. Washington, D.C.: Government Printing Office, 1932.